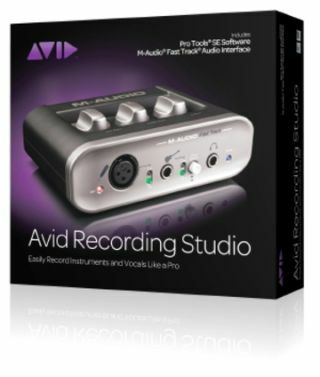 CLOSED Win 1 of 10 Avid Recording Studio bundles! We've got 10 sets of Avid/Pro Tools Recording Studio bundles to give-away, just head to the link and answer the question to enter! Chances are, if you own music that was recorded in the last 15 years, Pro Tools was probably used somewhere in the production chain. You don't need a professional's salary to use this software, though, because Pro Tool's parent company Avid has just released its new Recording Studio bundle, and we've got 10 copies to give away. Included in the bundle is a copy of Pro Tools SE, which runs on both Mac and PC, and comes loaded with over 100 virtual instruments, tons of effects and 3GB of copyright-free loops and phrases with which to build your own backing tracks. To get your guitar signal into your computer, Avid has bundled Pro Tools with the M-Audio Fast Track interface. This USB box includes a dedicated guitar input, as well as an XLR connection for a microphone, complete with phantom power so that you can use a condenser mic in your recording. Which of these is a digital format?